If you’re looking to plan a Florida destination wedding thats still easily accessible to Tampa Bay, look no further than Central Florida. I was recently treated to a weekend wedding experience at Reunion Resort, in Kissimmee, just an hour east of Tampa. What I loved most about my stay at Reunion Resort was that the property was absolutely stunning (pulling up the main building has a definite wow factor), everything was conveniently located on property and there are a variety of activities for all ages. The property truly is a resort, located on 2,300 acres featuring five restaurants, four bars, luxury suite-style rooms and villas, three signature golf courses, spa, tennis courts and a water park! 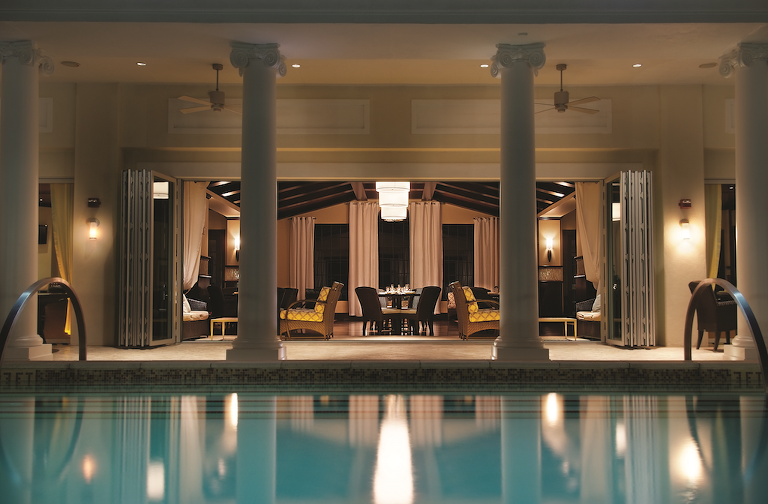 Your wedding guests will appreciate the variety of accommodations at Reunion Resort. 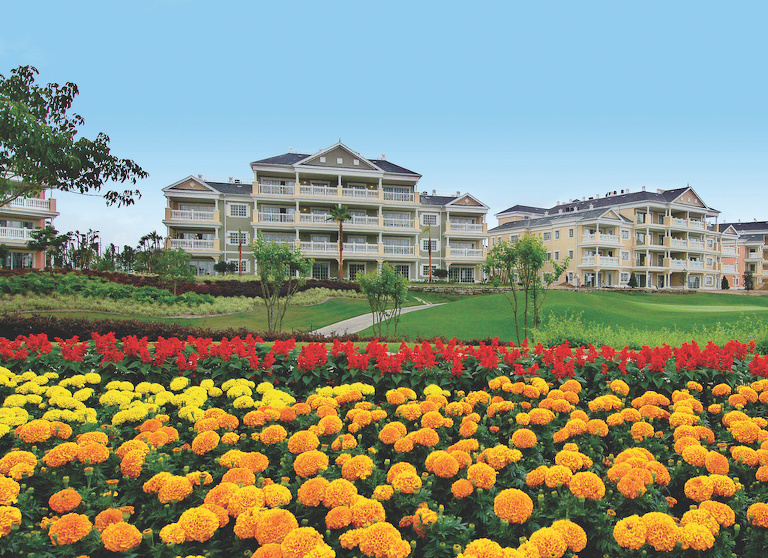 This is definitely not your average hotel stay; the resort features 13 different “neighborhoods.” Couples can choose the romantic multi-bedroom suites located in the main resort building with multiple restaurants and golf course views, while families can stay in spacious 1,700 square foot villas with room for everyone to spread out. If you’re looking for more privacy or want to share spend more quality time with friends and family, the property even offers private homes and mansions (which can also double as rehearsal dinner venues). Reunion Resort offers a variety of dining options, from its chic, rooftop poolside restaurant Eleven, where you can watch the hot air balloons take off in the morning and Disney fireworks at night to Forte, an authentic Italian bistro with family style servings and expansive wine list. One of my favorites meals of my stay was at the Grande Lobby Sushi Bar, which features, cocktails, apps and freshly made hand rolled sushi. The hotel also offers in-room dining and casual and poolside eateries around the resort. Whether you’re entertaining a family with kids, college friends or your girlfriends, there are lots of activities to keep everyone busy! Kids (and big kids at heart) will love the on-property waterpark, with lazy river to relax and soak up some sun. After getting your daily dose of vitamin D, take the free resort shuttle to the spa for a massage or mani/pedi. 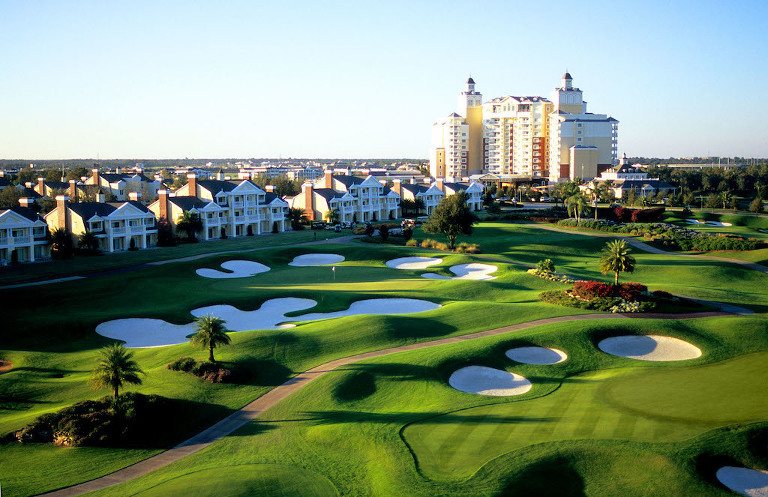 For the more active resort goers, Reunion Resort offers tennis courts, a fitness center, yoga, and of course golf. It’s the only place where you will find three golf courses, each designed by the sport’s greatest legends: Jack Nicklaus, Tom Watson and Arnold Palmer. If you’re new to the game or need to brush up on your swing, lessons are available from the resort pro at the Annika Sorenstam golf school. If you like the idea of golf, but not the precise skill involved, the resort also houses a foot golf course, which is a mix of soccer and golf. Any skill level can play, and it’s a ton of fun! (I didn’t want to stop playing). While you could stay at the resort a week and not run of out of things to do, Reunion Resort offers the best of both worlds because it’s only 9 miles to Walt Disney World, 16 miles to Sea World, 21 miles to Universal Studios and 32 minutes from Orlando International Airport. Our last night, we ventured to Disney Springs (formerly Downtown Disney) for shopping, dinner at Homecomin’ and Morimoto Asia, followed by and a romantic twilight after dinner cruise at The Boathouse. Located in Disney Springs, Chef Art Smith’s Homecomin’ features farm-to-fork comfort food cuisine. Chef Smith is a two-time James Beard Foundation award winner and was Oprah Winfrey’s private chef for 10 years. The chicken biscuits drizzled with hot honey and Church Lady deviled eggs are must haves! Definitely come with an extra empty stomach; you’ll need all the extra room because you won’t be able to stop eating! For a more exotic cuisine, head over to Morimoto Asia, which features an innovative Japanese cuisine. 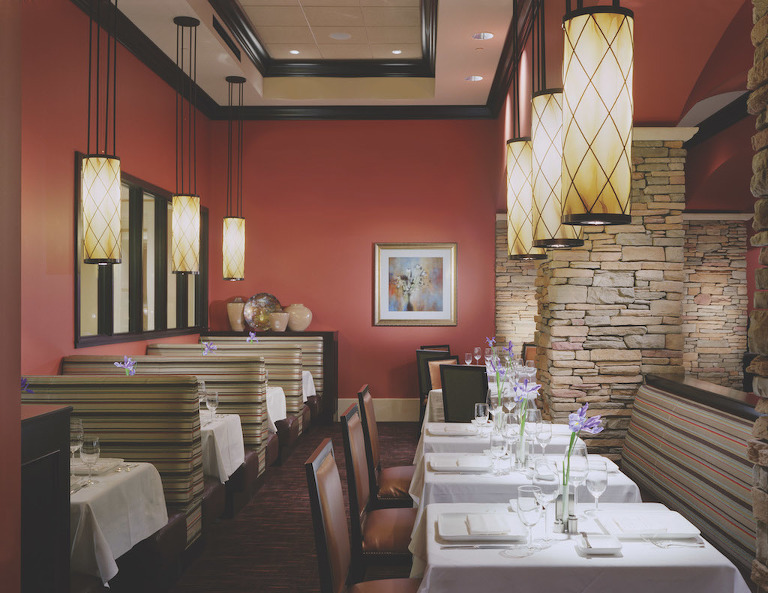 The architecture and decor of the restaurant is modern and sleek, making it the perfect restaurant to celebrate your upcoming wedding or to host a bridal shower or engagement party in their private dining space. Morimoto menu’s offers modern Japanese fare: sushi, wagyu beef, noodles, dim sum ramen and their signature peking duck. I’m not a huge fan of duck, but ORDER THE DUCK. It’s so crispy and flavor that you’ll want to make a special trip back, just to order the duck again! We ended our Disney Spring adventure with a evening cruise aboard the Venezia a 40-foot Italian water taxi from the Boathouse. We toured the waterways of Disney while being treated to chocolate-covered strawberries and a champagne toast. This would be the perfect ending to a rehearsal dinner, as you can charter the Venezia for up to 16 guests or book individually. For more information on hosting your wedding at Reunion Resort , contact Christine Corson at ccorson@salamanderhotels.com. Our weekend stay and activities were provided by Reunion Resort. The thoughts and opinions in this article are those of the editor of Marry Me Tampa Bay.